Viruses are one of nature’s smallest (“nano”), most efficient, machines, whose primary function is to infect and replicate in host cells. 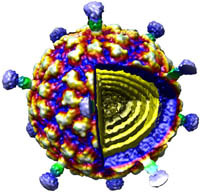 The predominant thrust of our research over the past 25 years has been to image and determine the three-dimensional (3D) structures of viruses to gain insights about the mechanisms they use to interact with their hosts so they can replicate and assemble a new set of mature, infectious particles. To accomplish this, we use cryo-electron microscopy (CryoEM) and 3D image-reconstruction methods to study viruses and various kinds of virus-complexes (e.g. 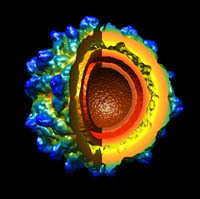 virus-antibody or virus-receptor) and virus-like particles at sub-nanometer (< 10-Å) resolutions. At this level of resolution, we can discern and distinguish viral components (protein, nucleic acid, lipid, carbohydrate) and secondary structural details such as a-helices and b-sheets in proteins. CryoEM is a powerful tool because it permits the structures of biological samples to be preserved in a near native state. Samples are flash-frozen (vitrified) in liquid ethane in a sub-millisecond time frame, which prevents ice crystal formation that would damage the specimen. This technique uses no chemical fixatives or stains and thereby helps preserve the hydrated structure of the virus (or any macromolecular complex). Specimens are then loaded into one of two, computer-controlled, transmission electron microscopes housed in Bonner Hall, both of which are able to maintain specimens at liquid nitrogen or lower temperature. These microscopes are used to collect upwards of tens of thousands or more virus images that are needed to obtain high-resolution 3D reconstructions. Such large numbers are required because each individual virus image is extremely noisy owing to radiation-induced damage to the sample caused by the high voltage electron beam and because the contrast in unstained samples is extremely low. In house, computer reconstruction techniques are continuously being developed and tested to more reliably and efficiently extract usable information from the noisy image data. We have developed a processing pipeline, called Auto3DEM, which automates nearly all of the tedious steps in the 3D reconstruction process. In favorable cases, we are able to obtain reconstructions at sub-nanometer resolution in a day or less after the images are recorded. In addition, we are developing tools designed to provide ‘real time’, 3D reconstruction feedback (i.e. in a few minutes or less) to the microscopist to further improve success of data collection. Viral pathogens from many different families are currently under investigation. These infect a wide range of hosts and include: human parvoviruses (bocavirus and several serotypes of adeno-associated viruses both as native virions and complexed with neutralizing antibodies and receptor molecules); human papilloma viruses that cause cancer (HPV-16) or genital warts (HPV -6 and HPV-11) or are listed as “high risk” (HPV-52); four distinct totiviruses (the invertebrate IMNV, the fungal HvV190S, and the protozoan TVV1 and GLV); the alphavirus group of small, enveloped, ssRNA viruses (e.g. Sindbis virus) that are human and insect pathogens, some of which are listed as possible agents of bio-terrorism; two large, dsDNA viruses (the insect CIV and frog FV3); three fungal partitiviruses (PsV-S, PsV-F, FpV-01); four bacteriophages (P22, Sf6, CUS-3, and φ29); and an insect tetravirus (NωV). Brodin, J. D., X. I. Ambroggio, C. Tang, K. N. Parent, T. S. Baker and F. A. Tezcan (2012) Metal-directed, chemically-tunable assembly of a monomeric protein into one-, two- and three-dimensional crystalline protein arrays. Nat. Chem., 4:375-382. Highlighted in Chem. & Eng. News (2012) 90(11):9. DiMattia, M. A., H-J. Nam, K. V. Vliet, M. Mitchell, A. Bennett, B. Gurda, R. McKenna, N. H. Olson, R. S. Sinkovits, M. Potter, Y. Sakai, B. J. Byrne, G. Aslanidi, S. Zolotukhin, N. Muzyczka, T. S. Baker, and M. Agbandje-McKenna (2012) Structural insight into the unique properties of adeno-associated virus serotype 9. J. Virol. 86:6947-6958. Gurda, B. L., C. Raupp, M. Naumer, R. Popa-Wagner, N. H. Olson, R. McKenna, T. S. Baker, J. A. Kleinschmidt, and M. Agbandje-McKenna (2012) Mapping a neutralizing epitope onto the capsid of Adeno-associated virus serotype 8. J. Virol. 86:7739-7751.Parent, K. N., C. T. Deedas, E. H. Egelman, S. R. Casjens, T. S. Baker, and C. M. Teschke (2012) The use of stepwise molecular display utilizing icosahedral and helical complexes of phage coat and decoration proteins in the development of robust nanoscale display vehicles. Biomaterials, 33:5628-5637. Parent, K. N., E. B. Gilcrease, S. R. Casjens, and T. S. Baker (2012) Structural evolution of the P22-like phages: Comparison of Sf6 and P22 procapsid and virion architectures. Virology, 427:177-188. 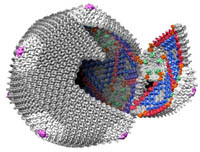 Ku, T.-H., M.-P. Chien, M. P. Thompson, R. S. Sinkovits, N. H. Olson, T. S. Baker, and N. C. Gianneschi (2011) Controlling and switching the morphology of micellar nanoparticles with enzymes. J. Amer. Chem. Soc., 133:8392-8395. Shen, P. S., D. Enderlein, C. D. S. Nelson, W. S. Carter, M. Kawano, L. Xing, R. D. Swenson, N. H. Olson, T. S. Baker, R. H. Cheng, W. J. Atwood, R. Johne, and D. M. Belnap (2011) The structure of avian polyomavirus reveals variably sized capsids, non-conserved inter-capsomere interactions, and a possible location of the minor capsid protein VP4. Virology, 411:142-152. Tang, J., J. Jose, P. Chipman, W. Zhang, R. J. Kuhn, and T. S. Baker (2011) Molecular links between the envelope glycoprotein and nucleocapsid core in Sindbis virus. J. Mol. Biol. 414:442-459. Tang, J., G. C. Lander, A. Olia, R. Li, S. Casjens, P. Prevelige Jr., G. Cingolani, T. S. Baker, and J. E. Johnson (2011) Peering down the barrel of a bacteriophage portal: the genome packaging and release valve in P22. Structure, 19:496-502. Yan, X. D., K. N. Parent, R. P. Goodman, J. Tang, J. Shou, M. L. Nibert, R. Duncan, and T. S. Baker (2011) Virion structure of Baboon reovirus, a fusogenic orthoreovirus that lacks an adhesion fiber. J. Virol., 85:7483-7495.